Programmable settings and extensive calculation programs, each with their own report pages, assist the user in reaching diagnoses quickly and accurately. Key applications range from reproductive and abdominal imaging of large mammals to small parts examinations of companion animals. The Falco Vet’s software includes calculation packages for cardiology, Animal Science and fetal age tables for bovine, equine, swine, sheep, llama, canine and feline applications. The extensive multiple-user and application setting capabilities add to the Falco Vet’s ease of use, a necessity in the busy environment of the modern large and mixed animal veterinary practices. Various linear and curved array transducers are available for use with the Falco Vet. The endorectal linear probes, useful for all aspects of reproductive imaging in large mammals, can also be used for external reproductive imaging in pigs, sheep and goats, as well as for high quality tendon and small parts examinations. 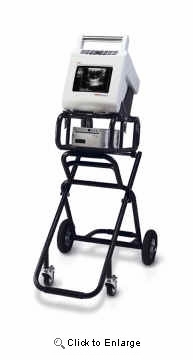 The curved array probes are particularly suited for abdominal and thoracic imaging in companion animals, in addition to small parts and plural surface imaging in larger species. The animal science probe is specifically designed for back fat measurements in both cattle and swine. 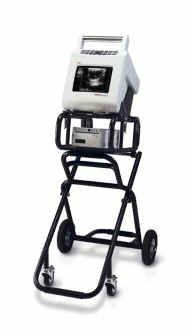 Excellent image quality, an intuitive user interface, programmable settings for multiple users and the range of lightweight and ergonomically designed transducers prove the Falco Vet is a truly functional and flexible ultrasound solution. In addition to the well-engineered inner works of the system, the Falco Vet has been designed to be a truly versatile and mobile system. Lightweight and compact, it can be easily used in small spaces and transported from room to room either with or without trolley. Furthermore, the Falco can be operated from an external keyboard and/or the built-in control panel and runs on either mains power or from a rechargeable battery. Unit, bottle of gel, main cable, disk drive, cine menory, cd with user manual and 6.0/8.0Mhz LA DF Vet Probe 30c/60MM(endorectal).